This week I’ve realised just how different this pregnancy is to when I was carrying Frog. It’s not the fact I’m far more knackered, already having a young child to run around after and juggling motherhood with work and general life stuff. It’s the fact I now blog. Without wanting to sound like a total blogging cliche, starting this blog has had a huge effect on my life. I’ve learned new skills, made new friends (real life friends who I see and spend time with – not just Twitter mates!) and managed to gain new freelance work from it too. Who knew, when I trained to be a journalist 8 years ago that blogging would become a valid string to my freelance bow?! When I was pregnant with Frog I did all the usual things: went to an antenatal class, Googled stuff about pregnancy, got excited about buying baby clothes. This time, I’m doing all that and more. As well as the odd Facebook status update (sorry non-pregnant friends – I know, I’m a baby bore) I have this pregnancy documented good and proper. I have more photos of the bump than I ever had with Frog. My thoughts, feelings, gripes and rants are laid bare for all to see. And, most importantly, I’ve connected with a whole range of other mums who are also expecting – a bonus I really never predicted when I started this little linky seven weeks ago. This is where I want to say thank you to Chelle at Unique and Chic for her little messages of support over the past few weeks. Whether it’s a quick “How are you feeling today?” or a “Don’t forget to put your feet up at some point!” Chelle has regularly been on hand via the medium of Facebook and Twitter with a kind thought. She’s also put together an inspired idea for a bump secret santa type present swap, which shows she is kind AND incredibly organised. Finally, if you’re feeling huge and pregnant and in need of a laugh, I urge you to read this post by Amy Ransom. It captures perfectly the last stage of pregnancy: denial. So pleased to see it’s not just me! 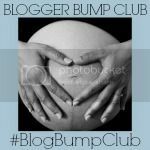 If you’d like to join the #BlogBumpClub it couldn’t be easier. Simply link up your latest pregnancy post below and grab the badge to display on your own blog. You’ll find a lovely welcoming community of expectant bloggers ready to read your post and nod along with cankle empathy. Plus, we’re all in the same boat and promise not to call you a baby bore. You can also join the chat on Twitter by tweeting with the hashtag #BlogBumpClub (I’m @mollyjforbes over there). i started blogging as a way to keep a pregnancy journal of sorts, but it has been so helpful, the blogging community have been so lovely, offering advice when i needed it, and being there to listen to my hormonal rants! god knows what i would do without you guys! it’s made pregnancy more enjoyable – i’m glad i’m not the only one who thinks this! Joining in for the first time, looking forward to catching up with everyones posts and sharing our pregnancy too! I didn’t blog my first pregnancy so can’t wait to this time round. I blogged my last pregnancy but only people I knew IRL read it now it’s all a bit different! Thanks again for starting #BlogBumpClub. I’m so happy I’ve started blogging my pregnancy, feels a bit like keeping a diary (will have to think about how to make it so it’s not only on internet some day) … and also to be connected to other preggies / mamas & read their experiences is very comforting. I’m really glad I stated blogging when I did (last November) because it means I am writing about the pregnancy and will remember it, which is lovely because it’s going to be my last one! I’ve been blogging since before I had children but this is the first time I’ve really concentrated on writing about my pregnancy, probably because of the gradual evolution of my blog over the years, and I love that I have so many bump pictures and little moments all written down. For the first time it’s possible that this is my last pregnancy so it’s nice to savour it! I wish i had started blogging sooner, I found myself so busy with bump 2 that it sort of just went by. You will have this lovely record to back on. It’s a definite bonus – I love looking back on posts from when I started blogging 3 and a half years ago and seeing how much my daughter has changed since then! I’ll look to you to start the night feed one and I’ll join in when I’m in that boat come autumn. Best of luck with the impending birth Amy – will be thinking of you. Hopefully you won’t be stuck in the #BlogBumpClub for too much longer!